The Graving Dock at the Halifax Shipyard holds a prominent place in both Halifax Harbour’s and in the city of Halifax’s history. A National Historical Civil Engineering Site, it was the largest dry dock on the Eastern seaboard of North America when completed in 1889, and continues to be a vital ship maintenance and repair facility for the Royal Canadian Navy’s east coast fleet. Using dynamite and manual labour, the solid rock that made up most of the Halifax peninsula was blasted to create the dock. The excavated rubble was then used to create an embankment where the supporting machine shop facilities would be located. 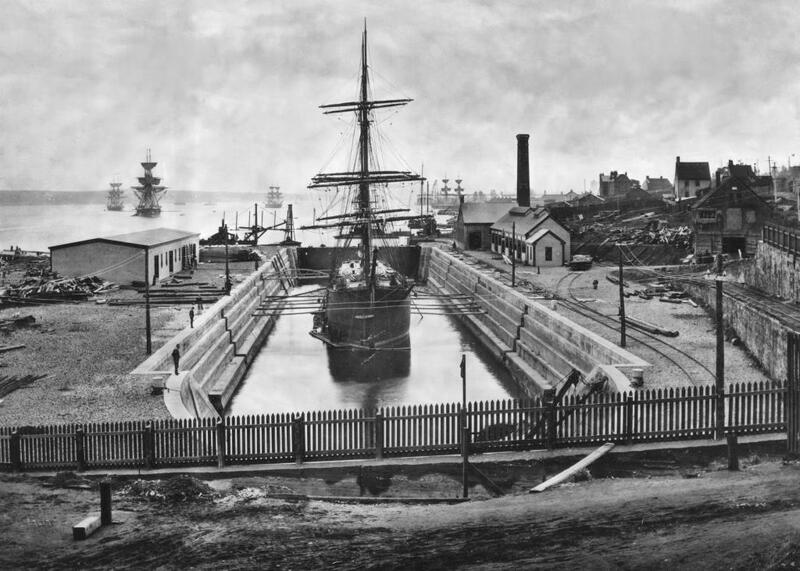 Designed by John Frederick La Trobe Bateman, an English engineer, and constructed by Pearson and Son of London, England, in association with Samuel Brookfield’s building firm in Halifax, the Graving Dock received its first vessel, HMS Canada, in September 1889. The Halifax Graving Dock was constructed during the age of square rigged sailing ships, yet remarkably, due to its forward thinking design, still performs the role for which it was designed today. It is the only remaining structure of the Victorian-era navy in Halifax. On December 6, 1917, the Graving Dock survived the Halifax Explosion, the largest manmade explosion prior to the atomic bomb. The explosion occurred adjacent to the Graving Dock at Pier 6, devastating a six square kilometre area. Sheltered by the Acadia Sugar Refinery and its supporting machine ship, the Graving Dock was protected from the direct impact of the explosion and was spared extensive damage. The Sugar Refinery was reduced to rubble in an instant, along with the Machine Shop and most of the other Graving Dock buildings. “The dry dock was in the heart of the worst area, and the large sugar refinery close by was merely a pile of bricks"
In the Graving Dock, the explosion swept across the upper deck of the Norwegian cargo ship Hovland, severely damaging masts, rigging, and superstructure, and killing five of its crew. Over 40 Graving Dock workers were killed as a result of the explosion. The Graving Dock returned to operation again just two months after the explosion and began to repair many of the vessels damaged during the explosion. The explosion physically cleared the area along the waterfront near the Graving Dock, allowing the Halifax Shipyard to expand and begin large scale shipbuilding. Today, the Halifax Shipyard continues to use the Graving Dock to service the Royal Canadian Navy’s east coast fleet. It was the primary location for the mid-life refit portion of the Halifax-class modernization, and continues to be used for ongoing maintenance and in-service support to the Halifax-class frigates. Having survived the Halifax Explosion, repaired thousands of vessels during World War II, and operated throughout the inevitable advancements of the industry—from wooden to steel ships and the exponential growth in vessel size and weight—the Halifax Shipyard Graving Dock is still performing today, essentially, according to its original design.